Published: Jan. 23, 2014 at 08:46 p.m. Updated: Jan. 24, 2014 at 10:16 a.m. 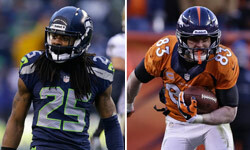 The Seattle Seahawks will have their offensive X-factor in Super Bowl XLVIII. Percy Harvin passed concussion protocol and has been cleared to play against the Denver Broncos, the team confirmed Thursday to NFL Media. With Harvin on the field, the Seahawks are a much more dangerous offense. Before the receiver suffered a concussion in the divisional-round game against the New Orleans Saints, quarterback Russell Wilson targeted Harvin prolifically. Harvin was optimistic earlier Thursday that he would be able to play, but he downplayed the significance. Harvin practiced fully with the team Wednesday and Thursday. Harvin missed the NFC Championship Game last Sunday and has played just 40 snaps all season. The dynamic pass-catcher will have more than a week to prepare for the Broncos. The one benefit of Harvin's year-long struggle with injuries is that Denver has little film of his in the Seahawks' offense. Don't discount Darrell Bevell's ability to creatively utilize his best offensive weapon on the biggest stage.